With big cities and rural hamlets nestled between mountainous landscapes, deserts, and beaches, California is filled with places to visit and things to see - most especially in the lush months of summertime. San Luis Opisbo is one of the oldest cities in California, founded by a Franciscan friar in the 1700s and located along the central coast between LA and San Francisco. 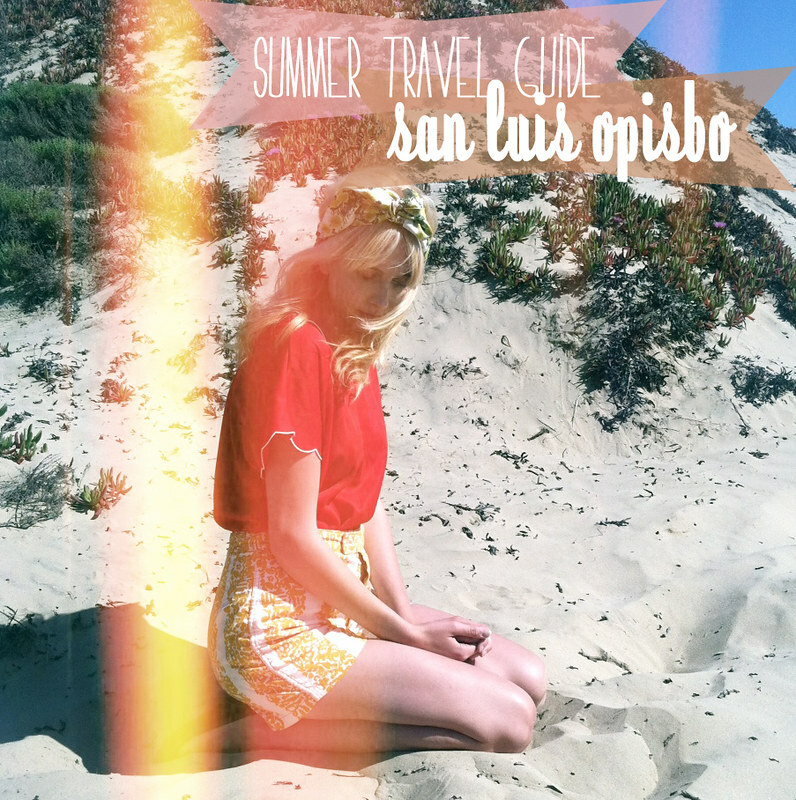 For this week's summer travel guide (and to herald today as the official summer solstice of the north), gorgeous photographer and student Taylor of The Little Deer lives in SLO and has agreed to share her stop-worthy favorites with us - here she is! Where to eat? Enjoy a meal outside by the creek at Novo or a wholesome, fresh American meal at Big Sky Cafe. Favorite afternoon excursion? One of my favorite parts about living here is how close we are to mountains and beaches. Shell Beach is just about the prettiest beach around, in my opinion. Hike Madonna Mountain for the best view or take a walk in Avila to the beach. The farmers market, every Thursday, is also a lovely way to spend an early afternoon. Favorite evening entertainment? Since it is a rather small town, the city shuts down fairly early. Grab a coffee or beer at Kreuzberg and catch a film at the Palm Theatre, the first solar powered theatre in the country, that features great indie flicks. Grab some donuts at a hip 24/7 create your own donut shop called SLO Donut Company. San Luis is full of amazing local musicians, so be sure to check out Downtown Brew or Kreuzberg for any shows. Where to shop? Ruby Rose is one of my favorite vintage shops around. It is filled to the brim with pretty furniture, vintage clothing, and fun little nick-nacks. You will certainly walk away feeling inspired! Curio for consignment clothing, Phoenix for used books, and Paper Sky for cute paper goodies. If you love antiques visit Arroyo Grande (a small town about 15 minutes away) where they have a few great antique shops, Green Vase is one of my favorites. What travel advice would you give to those visiting SLO for the first time? 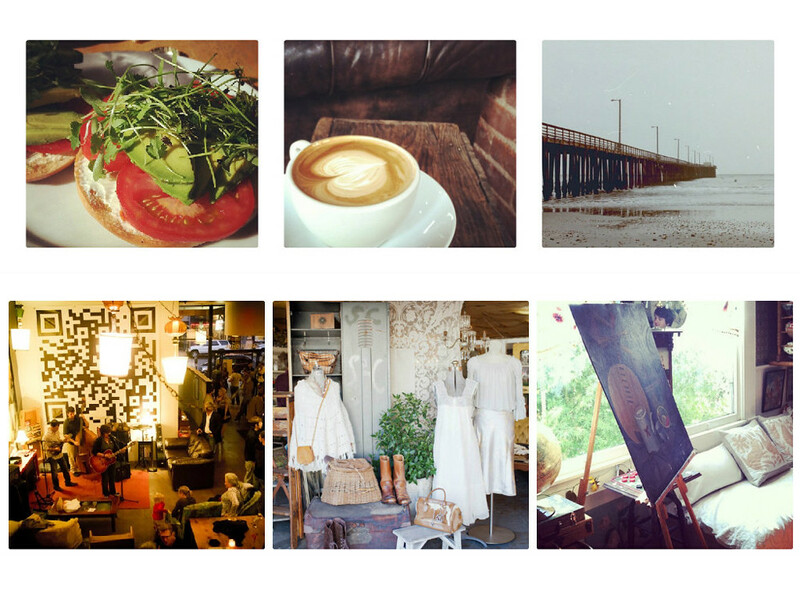 Another great thing about SLO is that you are so close to many other lovely little places. If you have a bit of time, be sure to visit the other towns around as well - Morro Bay, Arroyo Grande, Shell Beach, Cambria because they all have their own little charms. Thanks Taylor! Check out her blog and vintage shop. Also, the winner of the leather collar giveaway will be announced tomorrow - enter here!